With hypocrisy on their lips, the NCAA has spoken, and Todd Gurley will not return until November 15th against the Auburn Tigers. In reality, it could be a blessing in disguise for the Georgia Bulldogs. If they can win their next two games, they will have a healthy and fresh Todd Gurley back for a stretch run at the national championship. However, before any of that can become a reality, the Bulldogs have to put away their hated rival, the Florida Gators. Make no mistake about it, inferior Florida teams have beaten Georgia teams in the past and cost them a shot at a national championship – 2002 comes to mind. Will the Bulldogs win and take another step toward a national championship or will Will Muschamp take a huge step in saving his job? Some times a change is simply needed. Don’t get me wrong, the failure of the Florida Gators offense over the last two years is not quarterback Jeff Driskel’s fault. He has not shown a lot of growth, but that happens when you have four new offensive coordinators in as many years. With that said, this Florida offense needed a spark, and the Gators are looking for Treon Harris to fill that need. Harris doesn’t have a lot of experience, but he has shined when called upon. On the season, he has completed 12-of-18 passes for 263 yards and three touchdowns. He has also carried the ball 15 times for 51 yards. Florida will have a run-oriented game plan with a first-time starter, but Harris has to be able to make plays when called upon. When Harris extends the play with his legs, the Bulldogs must have someone locked in on Demarcus Robinson. The sophomore has 524 yards on 34 receptions and four touchdowns. Robinson has been inconsistent, but when he is good, he is dominant. The Florida defense has taken a step back this season, but they are still good against the run ranking third in the SEC in rush defense. With Gurley and Michel out once again, the Gators are hopeful they can slow the potent Georgia rushing offense down. Perhaps the best way to say it is, everything Florida is good at Georgia has a great counter-punch for. For example, the Florida Gators are No. 5 in the nation in average punt return yards with an 18.25 average. However, UGA is No. 4 in the nation in average opponent punt return yards, allowing just 13 total yards all season on seven returns. Todd Gurley is out, but the rushing game is in safe hands with Nick Chubb. Chubb is no longer a star in the making– he is simply a star. Moreover, the Florida defense has struggled with physical runners this year, LSU’s Leonard Fournette and Alabama’s Derrick Henry combined for 251 yards and three touchdowns on 47 carries. I would argue that Chubb is better than either of those running backs at this stage of his career. Keith Marshall could be back, but I would rather see Brendan Douglas, who had six carries for 36 yards last season. The Gators also have to be cautious of Hutson Mason, who has regained his confidence. Moreover, the return of Malcolm Mitchell and a healthier Chris Conley is opening things up in the passing game. Add to that the positive notes coming out of practice about Justin Scott-Wesley, the offense should be able to hit more big plays in the passing game. With all of that positive news, I have not even mentioned the improved play of Jeremy Pruitt’s defense. The upgrade in coaching is showing up on the field as the unit as a whole is improving weekly. The easy answer is turnovers. I know this is a very vanilla answer, but these two teams have been opposite extremes this season. The Gators have turned the ball over 15 times in the past five games. The Bulldogs, on the other hand, are No. 1 in the SEC in turnover margin at +13. The Bulldogs don’t have to win this column by a wide margin, but they can’t lose it. In fact, if they can break even, they will likely win the game. The other X-Factor is Georgia’s offense inside the red zone. I said this prior to the South Carolina game, and the Bulldogs cannot settle for field goal attempts. They did against the Gamecocks, and ultimately were defeated. The Gators are too talented and this rivalry is too heated. The Bulldogs must score touchdowns and go for it on fourth and short if needed. On offense, the game plan doesn’t change without Gurley. They will run the ball the majority of the game but will strategically use the passing game to soften up the defense. The game plan for Florida will be identical to the one against Missouri. Expect to see quick screens and passes to Mitchell and a whole lot of Chubb. On defense, the Bulldogs are putting eight and nine in the box. It’s no secret that Florida is committed to the run this game with Harris making his first start. Although Harris has been impressive in limited duty, he is only 5-11 and 178 pounds. 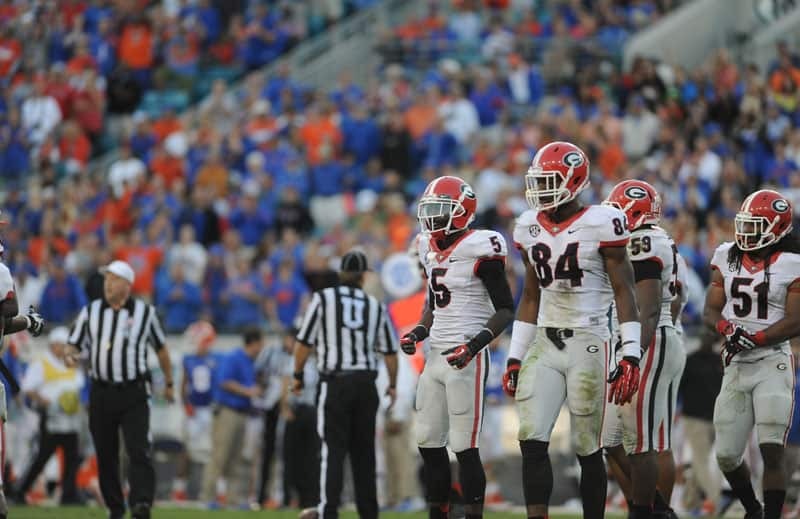 I expect quarterback killer Jordan Jenkins and sack master Leonard Floyd to be locked in on Harris most of the game. I firmly believe Harris will start the game, but I don’t expect him to finish it. UGA knows they’ve got to hold the fort down two more games before Gurley returns. They will, and in unusual fashion, Georgia will have this one wrapped up before the final moments.